As we know that the Nurburgring track recently got conquered by the Seat Leon SC Cupra 280, lapping the track in 7:58:4 minutes. Seeing this now Renault decided to grab back its title and thus prepared the limited edition hatchback, Renault Megane RS 275 Trophy 2014. 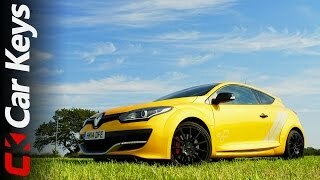 Though the news is still to come whether they succeeded or not, let us have a look at the review of Renault Megane RS 275 Trophy 2014. Interior of Renault Megane RS 275 Trophy 2014 is truly sporty and comes covered in Alcantara. As soon as you’ll open the doors, you’ll notice the Recaro Bucket seats that are wrapped in leather and Alcantara featuring red stitching to add the contrast and headrests adorned with Renault Sport badging. Sitting over these super comfortable sports seats you’ll be resting your legs over the Renault Sport floor mats starting to cover the surface soon after the Trophy branded grey sill which is individually numbered. Once you find yourself all settled over these luxurious sporty integrations, get ready to hold the Alcantara covered steering wheel with contrast red stitching over it to add the sportier touch. Dashboard is elegant with its design and complements the entire interior of Renault Megane RS 275 Trophy 2014 commendably. 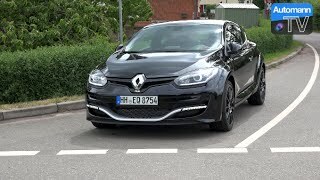 Upon first look exterior of Renault Megane RS 275 Trophy 2014 might look similar to its 265 sibling, but a little closer look will highlight the exclusive features amalgamated in creating the body. The front end gets a new splitter- like made from plastic, sitting amidst LED lighting. The LED daytime running lights which we just mentioned received a revision and are now grey in color with a ‘Trophy’ decal in center. Along the sides you’ll notice couple of stripes above the side skirts, adding to new body-livery. The entire setup rolls over the multi-spoke satin black wheels covered commendably by the wheel arches. The credit of which goes to lowered suspension which adds impeccably to the overall sporty look of Renault Megane RS 275 Trophy 2014. The Renault Megane RS 275 Trophy 2014 beneath its hood carries the same 2.0 liter petrol engine but with additional 10 hp. Yes this time with its 20. Liter petrol engine generating total output of 275 hp and peak torque of 360 nm, the Renault Megane RS 275 Trophy gets close to its target. The credit for this hike goes to titanium exhaust system which not only reduces weight but also allows the engine to deliver more aggressive note while burning the fuel.